As a result of this decline, Mr. Market's valuation of this company offers great opportunities for value investors. The company trades for just $20 million despite having a net cash position (cash minus debt) of over $14 million. Before the credit crisis caused the cancellation of many of the company's jobs, the company was earning profits of around $4 million per year! Because the company's cost structure is flexible (as discussed here), the company has also avoided losses during this recession despite the harsh drop in revenue. Some of the company's cancelled projects have been brought back online, and the company has expanded its reach. 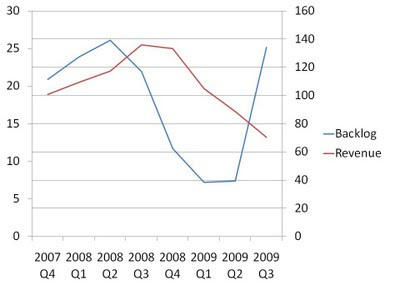 As a result, the company's backlog has not been this high since the early part of 2008! Investors don't have to wait long, as it appears the company will soon be returning to business as usual. Considering the company's cash balance, however, investors are only paying for a couple of years worth of earnings. 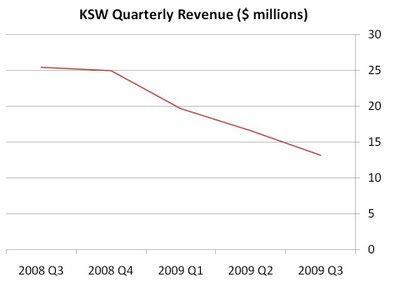 KSW has historically traded at only about 7.2 times earnings in years it has been profitable (over the last decade). And that was during a stretch where the market traded for more than 20 times profits. Assuming they make somewhere close to their record profits this year (based on their backlog) and with a slightly compressed multiple, say, 6, wouldn't the share price be fairly valued at about $3.78 (6*0.63)? Of course, the business is actually worth 15 times profits or so but this one seems to be a classic value trap, at least in terms of the multiple. It reminds me a lot of Tutor-Perini, another construction company with a perpetually low P/E. First off, I'd be a bit wary of using past P/E data in order to assume what a company will be worth going forward. Second, the P/E appears to have fluctuated dramatically over the period, so the mean P/E is not that important. For example, in 2006 and 2007, the company earned just over 50 cents per share, but the shares spent some time above 8 (for a P/E above 16) and a lot of time between 6 and 8, so there were opportunities to sell if you didn't wish to hold it for the long term.